The East Coast got a little taste of West Coast-style geology on Tuesday afternoon with a 5.8 magnitude earthquake that shook buildings—or at least rattled nerves—from North Carolina to Canada. 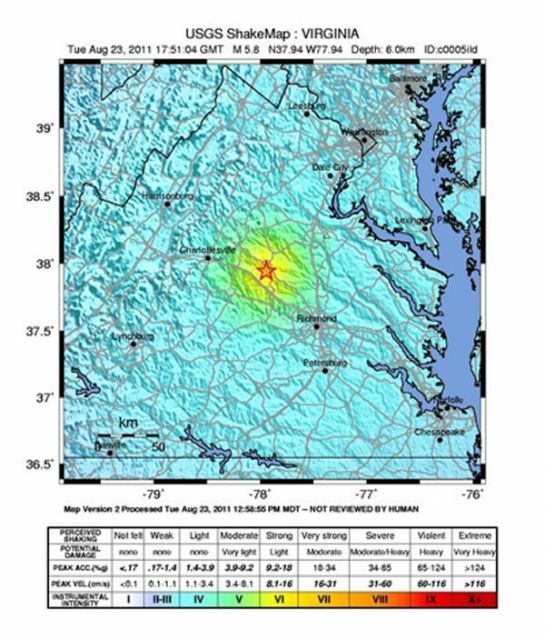 The quake’s epicenter was about 3.5 miles beneath tiny Mineral, Virginia, about 40 miles northwest of Richmond. While the quake certainly created some anxious moments, it was still about a thousand times less powerful than the Fukushima quake in March. So what happened, exactly, and what does it all mean? What was the damage? Structural damage from the quake appears to have been limited, but cell phone service was disrupted up and down the seaboard. Yep, cell phone disruption…and that’s about it. The absence of mass destruction prompted some Twitter users to make funny jokes about the quake. But then we found out that the National Cathedral and possibly the Washington Monument were both damaged, which isn’t funny. Okay, so why should we even care? One reason is that nearby nuclear power plants are only designed to withstand a magnitude 5.9-to-6.1 quake, leading the Nuclear Regulatory Commission to shut down at least two Virginia plants even though an NRC spokesman said that “as far as we know, everything is safe.” One plant lost power just after the quake and turned to diesel generators for backup. Still, the event raises questions about the safety of nuclear power plants and what the impact of a really big quake could be. Earthquakes in the central and eastern U.S. are typically felt over a much broader region than on the West Coast. “A magnitude 5.5 eastern U.S. earthquake usually can be felt as far as 500 kilometers [300 miles] from where it occurred, and sometimes causes damage as far away as 40 kilometers [25 miles],” according to the USGS. Being far from plate boundaries, the older and denser continental crust is much more like a solid sheet of bedrock than the fault-filled crust on the West Coast, allowing seismic waves to travel farther. Does this quake make another East Coast earthquake more likely? Possibly. As we reported after Japan’s Fukushima earthquake, there is some evidence that when a quake occurs, stress is relieved in one area of a plate and transferred to other parts of that plate. How did DC’s exotic fauna react? The Smithsonian National Zoo released a statement detailing the reactions of everything from apes (who ditched their lunch and took to the trees seconds before the quake hit) to snakes (crazed writhing) to panda bears (who were characteristically unperturbed).